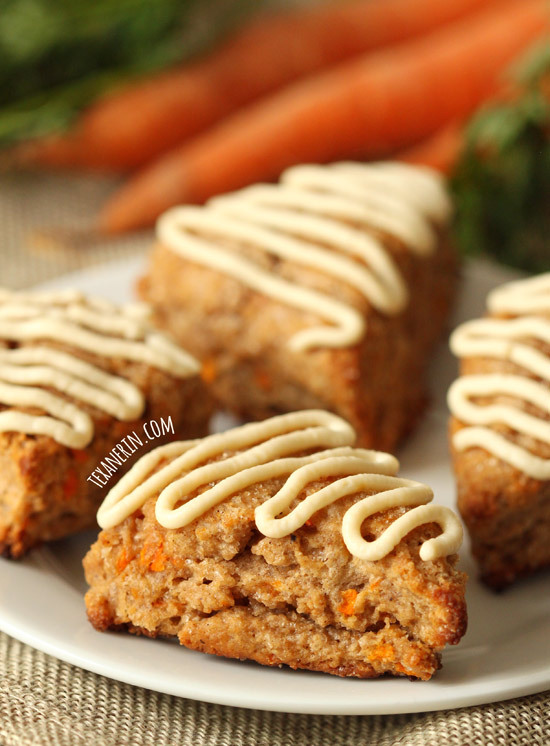 These carrot cake scones are made a little healthier with whole grains, less sugar and maple sweetened cream cheese frosting! In preparation for Easter, I’ve been making carrot cake everything for the past month. 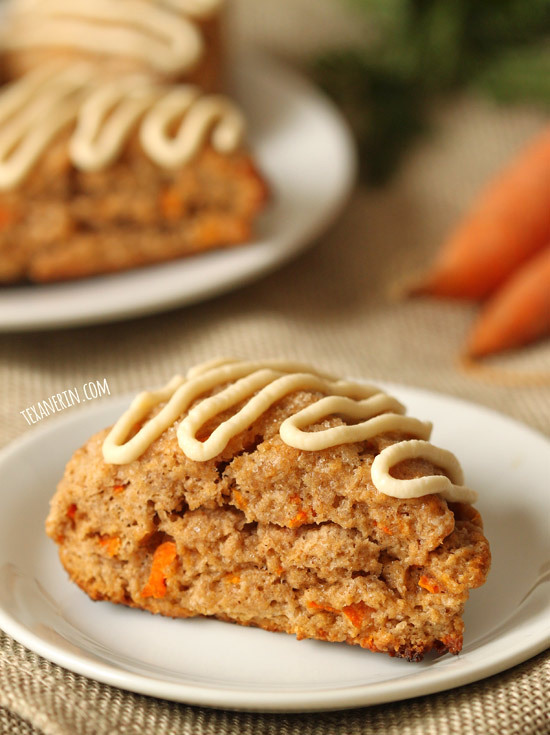 Up first we have these carrot cake scones! I used my favorite scone base, which is the same one found in these chocolate orange scones. My attitude towards scones is why fix something when it’s not broken? Or even kind of perfect? ;) I tried way too many scone bases before I came up with that one. I’m just super picky when it comes to my scones (and admittedly, almost everything else). 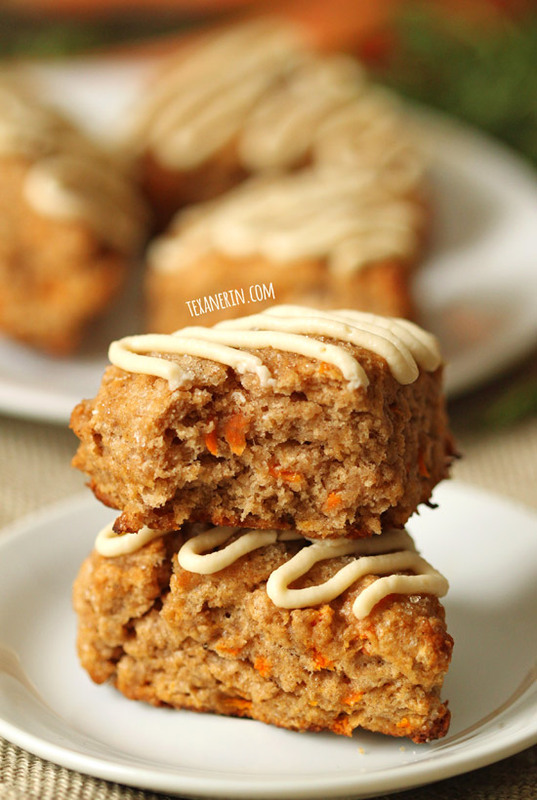 These carrot cake scones are softer than I like my scones to be, but they’re not nearly as soft as some of the cakey and muffin-like carrot cake scones out there. I’ve been doing a lot of experimenting with baking with carrots and it seems like no matter what you do, carrots just make things softer. The little devils! I’ve made these scones a few times now and they’re definitely best served fresh from the oven. They’re okay later, but they get a little too hard. Carrot cake without cream cheese somehow involved is just kind of pointless (right?! ;)) so I felt like I had to pipe a little cream cheese frosting on top. Before I made these scones, I didn’t think it was possible to make cream cheese frosting without powdered sugar. But it is! I used just a little bit of maple syrup in this cream cheese frosting and it was awesome. The recipe, as written, probably wouldn’t work for a cake (it’s a bit firmer than traditional cream cheese frosting) but I’m going to work on that. I’m guessing a little milk is all that’s needed to thin it out! The scones themselves are dairy-free (you can use any milk you like in the scone base) but the cream cheese frosting obviously isn’t. You can use a dairy-free cream cheese for the frosting or just leave it out completely and sprinkle some unrefined sugar on top of the scones before baking. These aren’t very sweet at all so I highly recommend the additional sugar! Preheat the oven to 400°F (205°C) and line a baking sheet with a Silpat or piece of parchment paper. Mix together the flour, sugar, baking powder, salt and the spices. Cut in the butter with two knives or a pastry cutter until the mixture resembles coarse crumbs. Stir in the grated carrots and then tablespoon by tablespoon, mix in the milk. Sometimes I just need three tablespoons, but some days I need six. Don’t over mix and don't add to much milk! You want to add just enough milk so that the dough holds together, but if you add too much, the dough will be muffin-like. Transfer the dough to the Silpat or parchment paper and form a circle about 3/4" thick and then cut 8 triangles. Spread them apart on the pan and bake until slightly brown around the edges, about 12–15 minutes (it’ll depend on how big they are). They should be firm and feel slightly hard when you press the top of the scones. While the scones are baking, prepare the frosting by mixing all the frosting ingredients together. Remove the scones from the oven and let them cool for 15-30 minutes. Pipe or spread on the frosting and serve immediately. If there are any leftovers (with frosting on them), store in the refrigerator. If the leftovers are unfrosted, store at room temperature. Store any remaining cream cheese frosting in the refrigerator until ready to use. If you use unrefined coconut oil rather than refined, there might be a slight coconut taste. 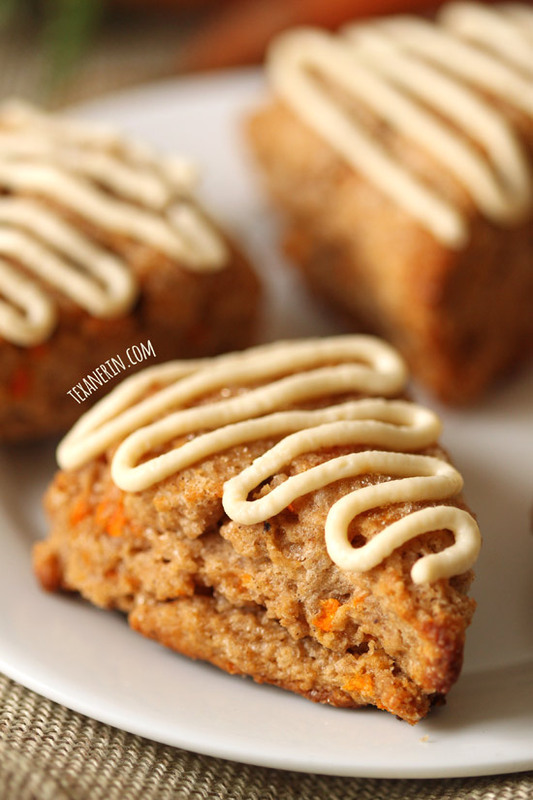 36 comments on “Carrot Cake Scones with Cream Cheese Frosting (100% whole grain, dairy-free)” — Add one! 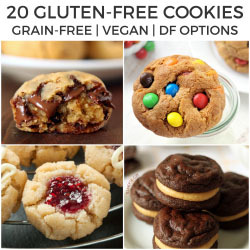 Could these possibly be made with almond flour? I’ve got a whole bag needs to be used up. Unfortunately not. Almond flour is only interchangeable with other nut flours and not wheat. I just had a bite of these as they came out of the oven, and WOW. Absolutely perfect in every way. They are so perfectly spiced that I’m not even gonna make the icing. This time. SO happy to have found this recipe and your blog today. Thank you! You’re welcome! I’m happy you found the recipe and the blog, too. :) And that’s great that the scones came out so well! Thanks for your comment. When you cut the scones out, do you leave them in a circle or spread them out before baking? These aren’t dairy free if they have cream cheese. Please read the second to last paragraph of the post! Hi Deannisa! Regular all-purpose flour should work fine. Hope you’ll enjoy them! I made these but not exactly as the recipe is written. I used 2 cups AP flour because I also added a quarter cup of chopped pineapple and a tsp of vanilla. I also increased the salt to a half tsp. They came out perfect. Cant wait to make them again. I cooked this delicious scones in HB and result was just great! The taste is out of expectation and texture is very soft. Thank you very much for this recepy! I’m so happy that you enjoyed the scones! You’re so welcome for the recipe. :) What does HB mean? Thanks a bunch for your comment! HB stands for Home Bakery machine. Sorry for using this abbreviation. I thought it is like international one. Like the recipe but I find it less carrot cake flavoured and sweet then I would like. Would adding more spices a/o coconut sugar boost this? For the cream cheese, is the vanilla actually vanilla extract…? Or like legitimate vanilla scrapped out of the vanilla bean? Every spring, my major obsession with carrot cake rears its head and I crave ALL THE CARROT CAKE THINGS. These are no exception, Erin! They look deeee-vine. And so delicious. And I need them. Haha. This was the first year I tried anything other than regular carrot cake. Don’t know why I waited so long! Wow, these scones look so delicious! Bookmarked this recipe–thanks for sharing! Would it be possible to substitute the sugar for dates? And if so how many would you suggest? I’ve never made that substitution so I can’t really say. Sorry I can’t be more of a help! These sound perfect. And amazing. And like everything I want. I can’t have baked goods for a few weeks (as part of a challenge that I’m doing for myself…) but I can say with absolute certainty that Iw ill be dreaming about these for the next 16 days! These look amazing–exactly as scones should look–they have the right height and didn’t spread when baked as lesser “scones” do. 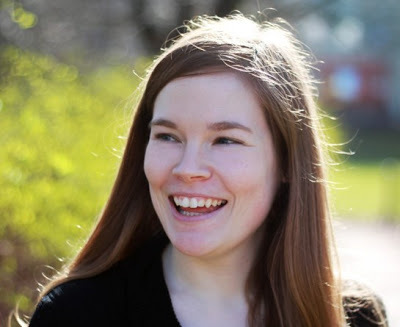 I LOVE your work on this blog–you are my baking kindred spirit. are they dairy free if there’s butter in them? they look soo delicious regardless! These scones look so absolutely gorgeous!